2018/19 has been a season to forget so far for the Los Blancos. They lost Cristiano Ronaldo in the summer and despite many big names being linked to the club, no major signing was made. To make matters worse, none of the four summer signings have made a significant impact this season. Former manager Julen Lopetegui was sacked after three miserable months in charge that saw the team lose 6 out of 14 games, including a 5-1 hammering by eternal rivals Barcelona. His replacement Santiago Solari has seen some improvement, winning 7 out of his 9 games in charge so far but there is still much improvement that needs to be made. 20-year-old River Plate midfielder Palacios has been on Real Madrid's radar for quite some time now. The Argentine just won the Copa Libertadores at the Santiago Bernebeau, helping his team defeat local rivals Boca Juniors 3-1. Marca has reported that a deal has been finalized between River Plate and Real Madrid, and the Argentine's signing will be announced shortly after the Club World Cup. Palacios might face his future club if River ends up facing Real in the tournament. His signing will continue Club President Fiorentino Perez's policy of looking for young talent in South America. Palacio will join other South Americans Vinicius and Rodrygo who have been signed by Real. Palacios is known for his passing ability and is pretty good in the air and at just 20 years of age, he has a lot of time to improve and become a world-class midfielder. He might be the replacement Real need for Luka Modric. The 33-year-old Croatian has shown signs of fatigue on numerous occasions this season. 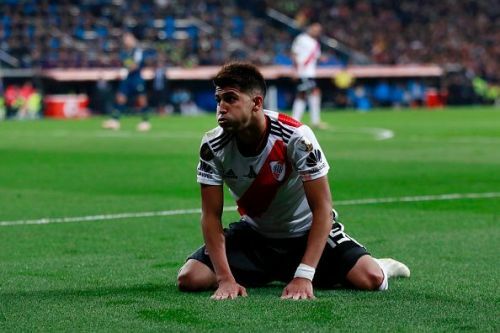 River Plate, however, would hold on to the midfielder for as long as possible. The deal is likely to be similar to that of Rodrygo and Vinicius, with the players only joining a year after their singing.